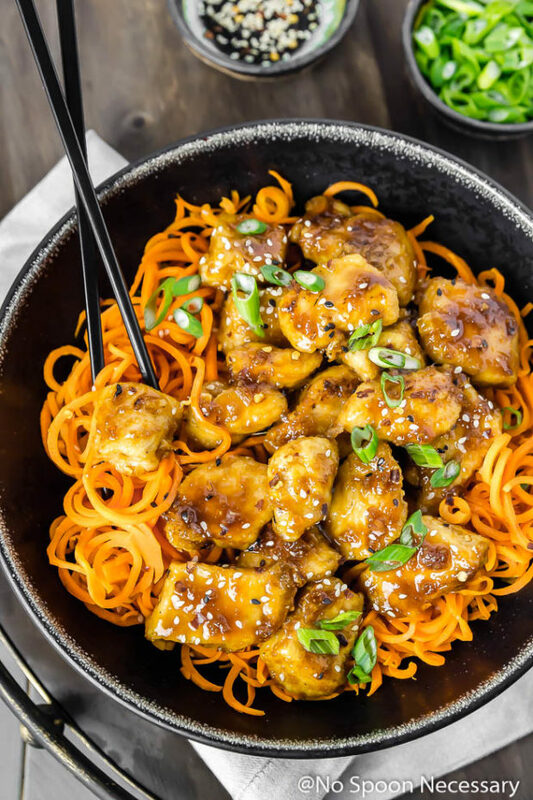 Sticky, sweet and savory crispy baked Honey Ginger Garlic Chicken over crunchy spiralized strands of carrot noodles are a match made in healthy, fake-out take-out heaven! 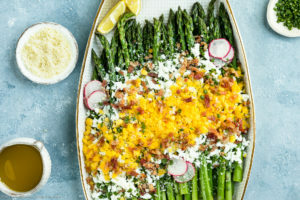 Easy to prepare and even easier to devour! Hello Friends and happy almost weekend! How has your week been going? Apparently this past Monday – Blue Monday – was the most depressing day of the year. So if you are here, reading this (nonsense), and made it through that manic Monday, you should be doing A-Okay. Anyways, moving on. because I’m keeping things short and sweet today. This year I’m trying to be all about that bass variety on this here blog, where spoons are sometimes necessary despite the name. Healthy, indulgent. Vegetarian, carnivorous. Sweet, savory. Boozy, non-alcoholic. You name it, I’m going to try and provide it, so feel free to email me or drop requests in the comments section at the bottom of any post. 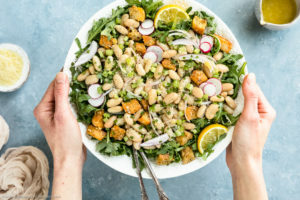 We started out the year with delicious vegetarian salads and skinny eats, because New Year, New You goals. And then, we indulged with some baking and hearty meals, because WINTER! 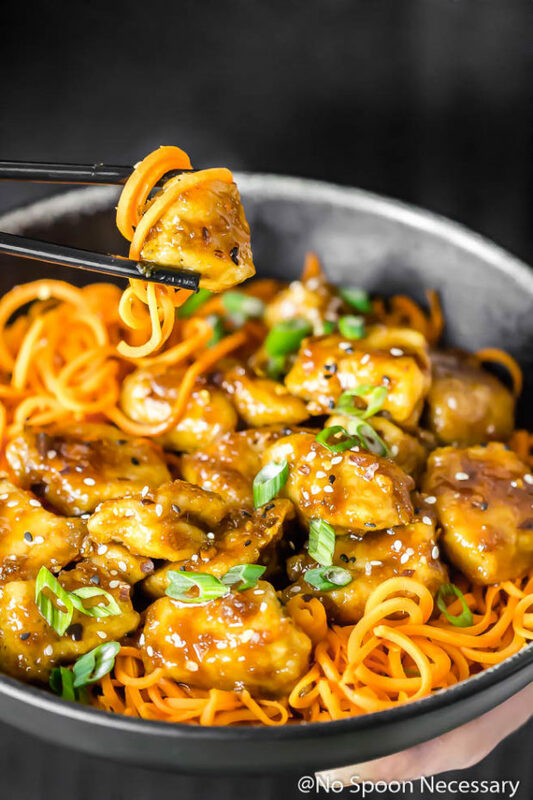 Now I’m coming at you with a healthy, yet seriously satisfying dish with an Asian and spiralized twist. These bowls are bomb, my friends. 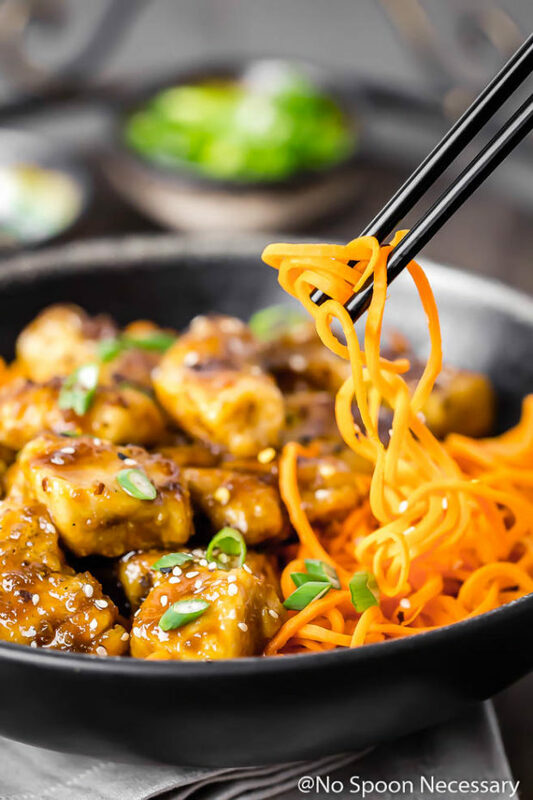 They are a healthy spin on fake-out take-out, and they were inspired by my favorite Asian ginger-carrot dressing, which I could seriously guzzle by the gallon. No joke. 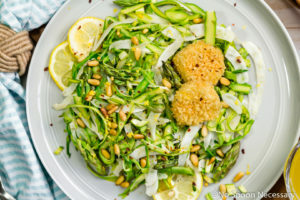 I am always looking for ways to turn that dressing into a meal. Remember my ginger carrot dressing Hummus? No? Go check it out now. I’ll wait….. 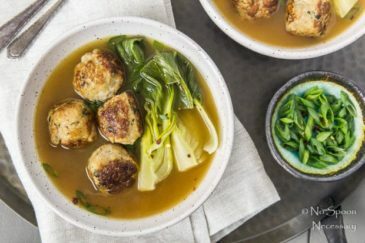 The sauce in these carr-oodle bowls (<– totally just made up that word) is sticky, sweet, savory, garlicky, gingery and seriously scrumptious. The bite sized pieces of chicken are crispy, while the inside remains tender and juicy without deep frying. This is possible thanks to a dredge in cornstarch and quick flash in the pan before being baked. 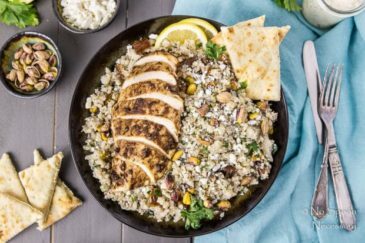 And since the chicken is baked instead of fried, you can keep up with those healthy New Year’s goals and still devour a few pounds of this chicken. But you can’t have a carroodle bowl without the carrot noodles. 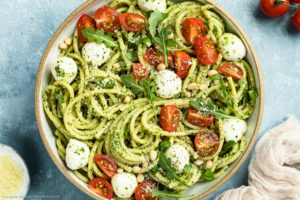 If you like zucchini noodles, I can guarantee you are going to like carroodles. 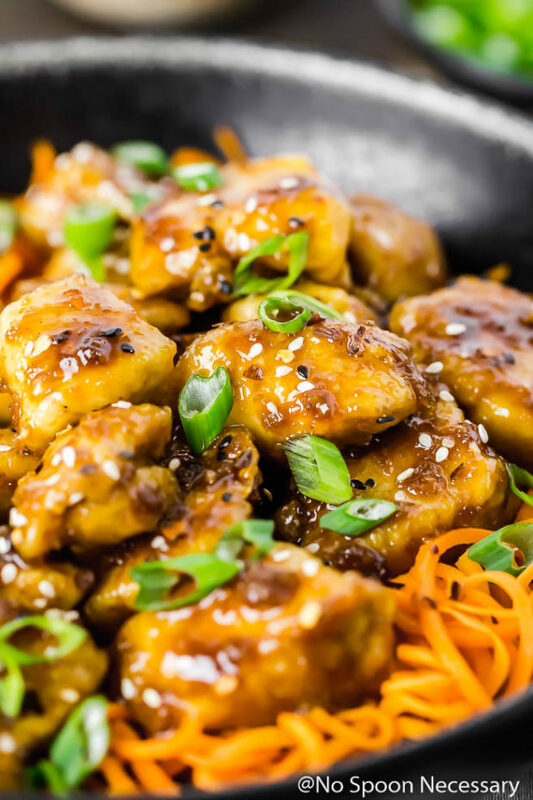 They are slightly crunchy and when tossed with the honey ginger garlic sauce they are veg-tastically delicious. Honestly, I was eating the carroodles by the bowlful when I realized we had polished off all the chicken. 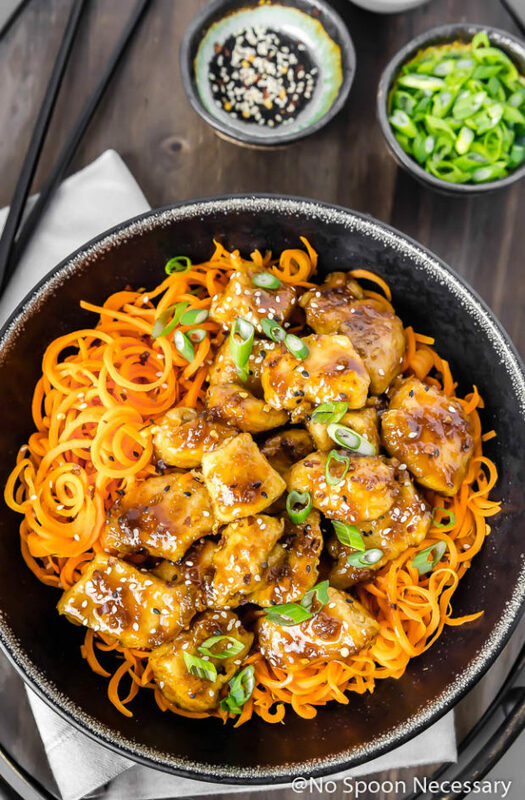 If you love take out, but don’t love all the calories that come with it, I highly recommend you try these Honey Ginger Garlic Chicken Carrot Noodle Bowls. I pinkie promise you will love them! Until next time friends – Cheers to carroodles being all the rage. 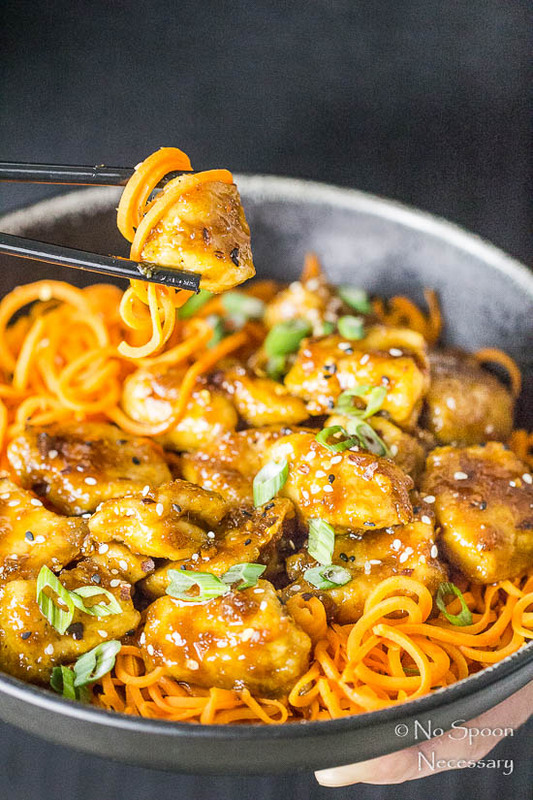 Sticky, sweet and savory crispy baked chicken over crunchy spiralized strands of carrot noodles are a match made in healthy, fake-out take-out heaven. 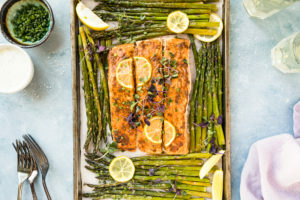 Prepare a 8x11’’ baking pan with cooking spray and preheat oven to 400 degrees F.
For the Chicken: Place the chicken pieces, cornstarch, salt and pepper in a plastic bag. Shake the bag until the chicken is well coated in cornstarch. Heat ¼ cup oil in a large sauté pan over medium-high heat. Add the chicken, in batches if necessary to not crowd the pan*, and sauté until lightly browned, turning to cook all sides, about 2-3 minutes. (chicken will be raw on the inside) Transfer to prepared baking pan and spray the top of chicken with cooking spray. 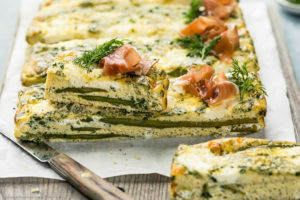 Bake in preheated oven for 15-20 minutes, or until cooked through. Meanwhile: Wipe pan of excess oil and reduce heat to medium high. Add 1 tablespoon clean oil to the pan. Add the carrot noodles and a pinch of red pepper flakes. Cook, stirring frequently, until softened, about 5 minutes. Season to taste with salt and pepper. Remove to a bowl and set aside. Add the garlic to the pan and sauté until fragrant, 30 seconds to 1 minute. Add the remaining sauce ingredients and bring to a simmer, whisking occasionally. Simmer for 3-5 minutes or until sauce in thickened. Turn heat off under skillet. 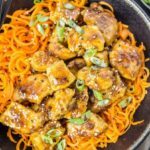 Serve chicken over carrot noodles. 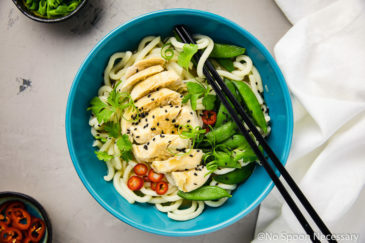 Garnish with scallions, sesame seeds and additional red pepper flakes. 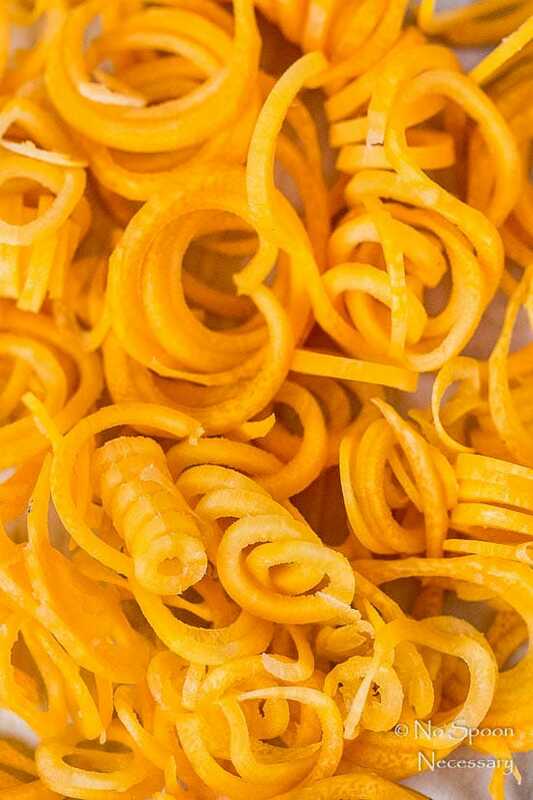 *If you don’t have a spiralizer, you can use a vegetable peeler to shred the carrots. 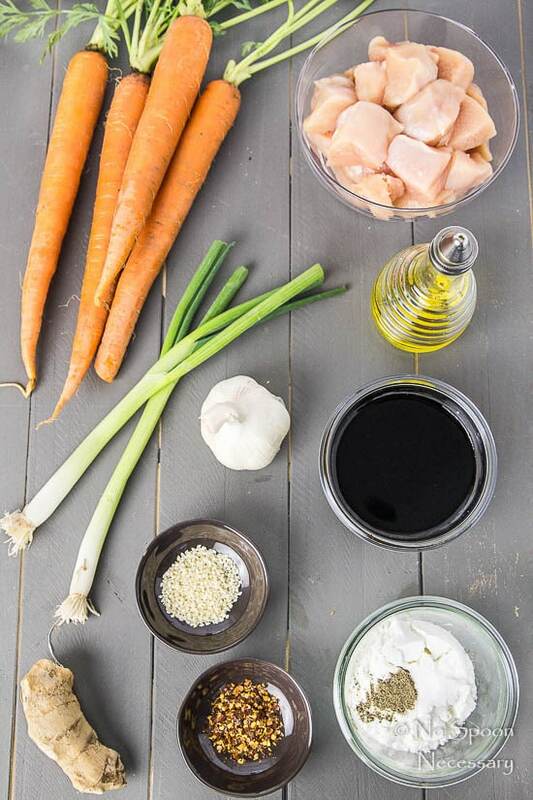 *If cooking the chicken in batches, add more oil to pan as needed. Is it really a 1/4 cup of ginger. I’ve never used that much fresh ginger in anything. Thank you so much for pointing that out! I switched recipe cards to make them more user friendly, and unfortunately there were a few hiccups. It is supposed to read 4 teaspoons! However, if you don’t like a strong ginger flavor, definitely decrease the amount of ginger to suit your own taste. 😉 Again, thank you for catching that! Cheers! If I omit the sake, do you think that will have a big impact on the flavor? Instead of simply omitting the sake, I would substitute rice wine vinegar mixed with water. For a similar flavor match, you can mix sake with water at a 1 to 3 part ratio. 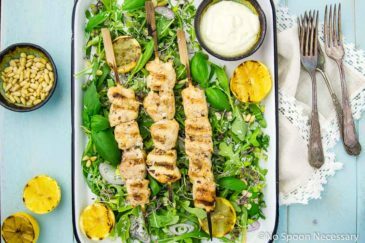 So for this recipe, I’d use 1 tablespoon of rice wine vinegar mixed with 3 tablespoons of water. Granted the result will not taste exactly like the original recipe made with sake, but you will be pretty close! Hope that helps! Cheers and thank you for stopping by!